Tulips are beautiful flowers. Why not have them in your garden all year? These are bright and have much motion in them. Adds variety to your group of lamps.The golden color you see is the light shining through the cut out patterns. 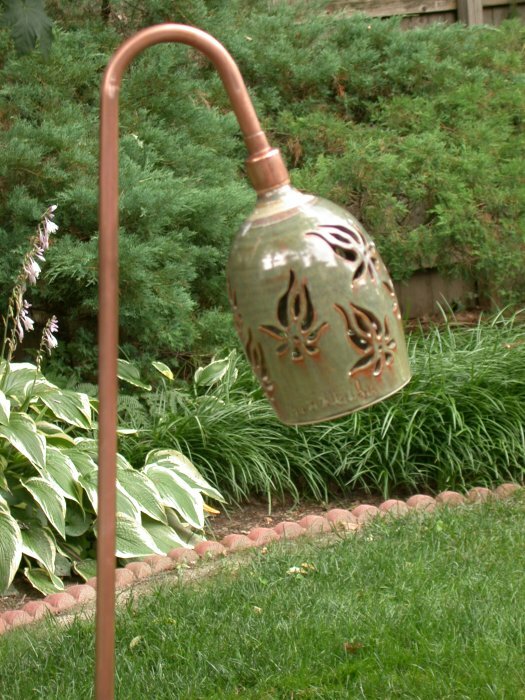 Tulips surround the globe, that is 6" in ht and 4-5" in diameter, mounted on a copper pipe that has curved area at the top to gently point the lamp to the pathway or special garden spot to highlight. The pipe reaches about 4 feet tall from the ground and has a spiked attachment to ensure the garden lamp does not swivel or lean forward. It is wired with low voltage wire which needs a transformer using only 12 volts, with a timer, keeping your power bill low. Easy connection to a ground wire. Other colors aqua blue, lavender and variegated brown (show here) need to be ordered. It takes me about 8 weeks to complete an order.